My 40th birthday arrived near the end of October. I had been regarding its approach in a thoughtful mood. My 30th birthday had been at the point of major life changes, with marriage and fatherhood each arriving within a month of my birthday. Since my crystal ball tells me that this decade will also bring major changes, I felt the need to mark the day with a personal challenge to set the correct tone for the coming years.With cycling occupying my mind more and more over recent years I decided that it was appropriate to attempt my first long bike ride. I set a goal of 100km. This is no big deal to many, many riders but it is twice my previous longest ride. Although I ride a bike almost every day of the year they are always short trips, averaging about 20 km per day. I felt that I was in good shape, but would it translate into the ability to achieve longer distances? Also, I would now be 40 years old. Surely I would wake up on the morning of my birthday in a suddenly decrepit state. 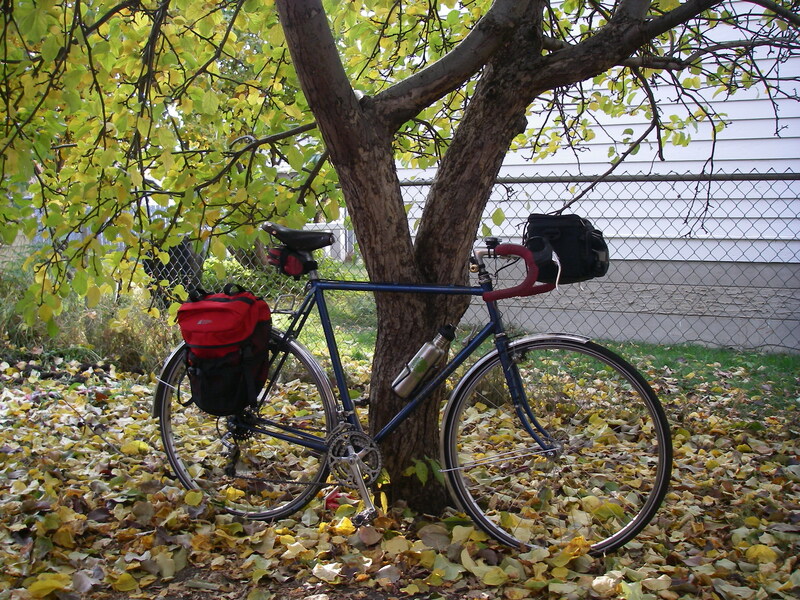 My bike choice was obvious : my 1983 Nishiki Continental Touring Bike. It is a really lovely ride, smooth, light and reliable. For the trip I picked up some skookum new Schwalbe Marathon tires and a bike computer so I could know how far I had cycled. 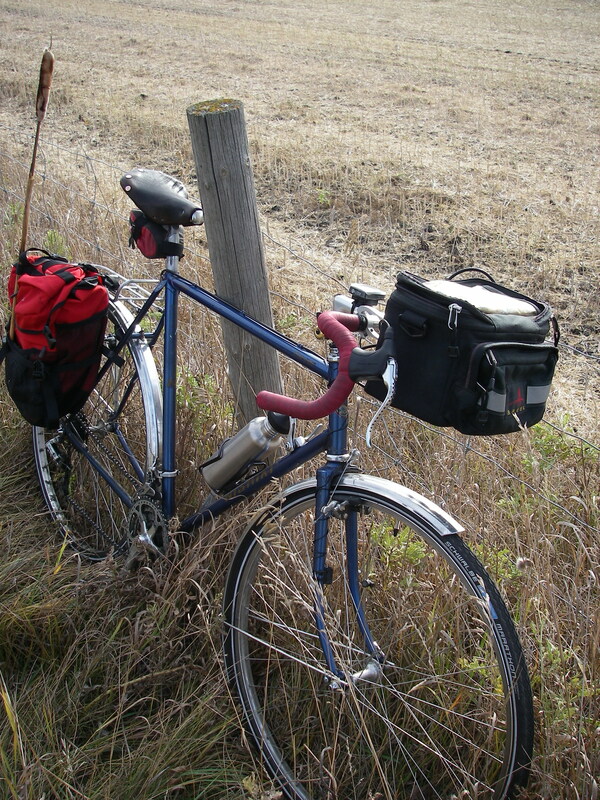 I had recently bought a used Arkel handlebar bag just because it was cheap and I now had reason to use it. I had hoped to finish setting this bike up for touring this summer but it never happened. This trip would hopefully make up for that a little. On the morning of my birthday the temperature was near the freezing mark. 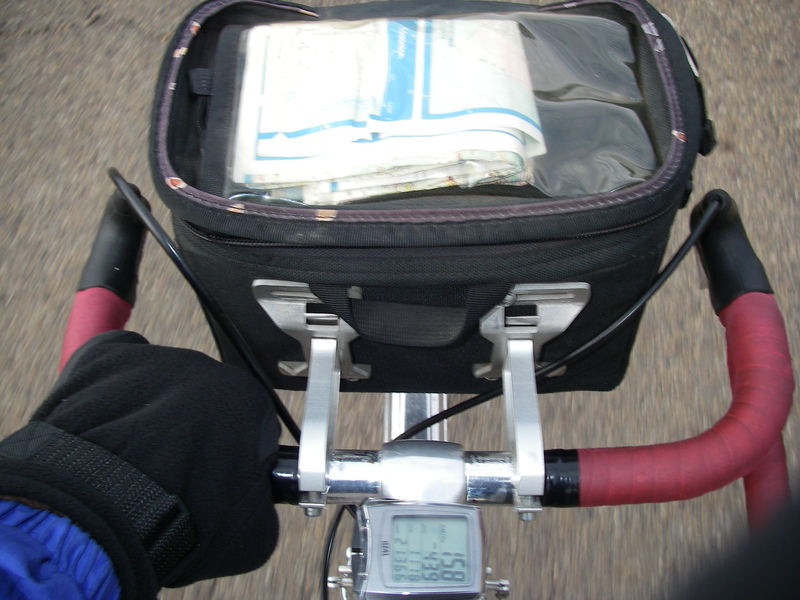 I dressed accordingly and brought a small pannier to shed layers into. As I don’t actually own a water bottle I had to borrow one from my unsuspecting, sleeping wife. 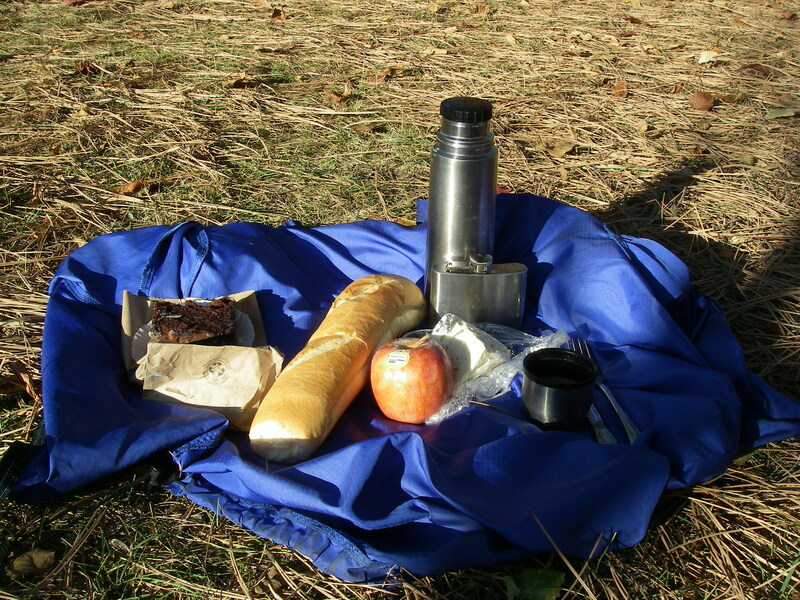 I supplemented my lunch materials with a few items from the local bakery . I probably have the wrong attitude to ever be any sort of sporting cyclist: I didn’t pack anything for hydration or nutrition but instead brought food and drink. 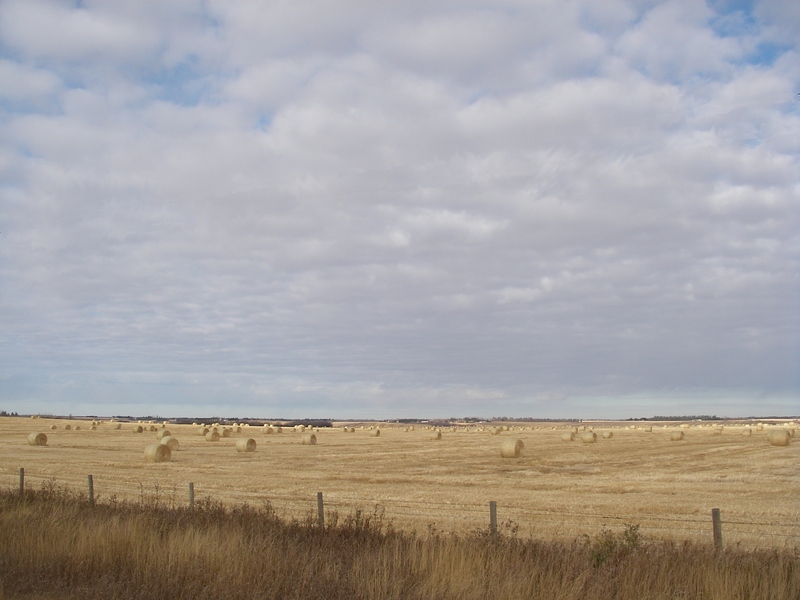 The Environment Canada weather report informed me of steady winds from the Northwest. I accordingly decided that the first part of my trip would be to the North and West so as to tackle the winds when I was at my freshest. 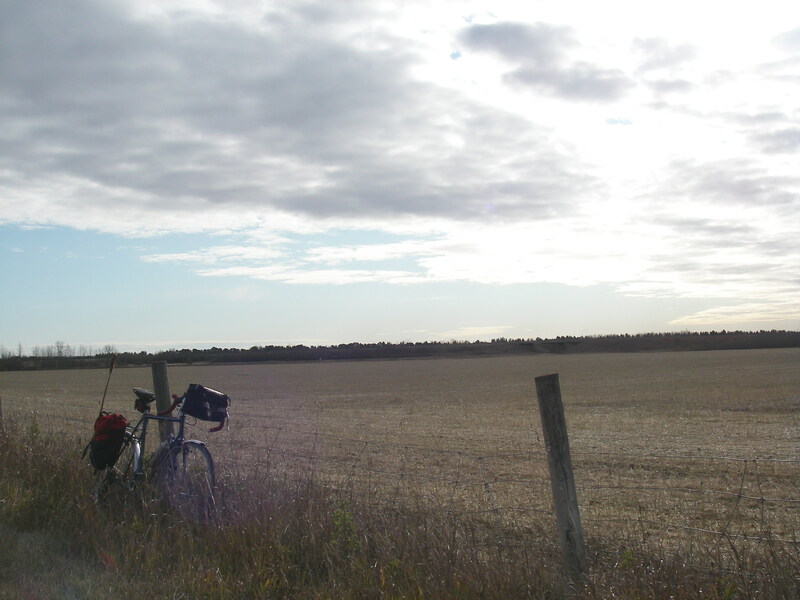 I planned to cycle just North of the city and explore the surrounding countryside.The first part of the trip was easy. I sped through familiar neighbourhoods and enjoyed the sights. I dipped into the river valley and headed North past Hermitage Park. 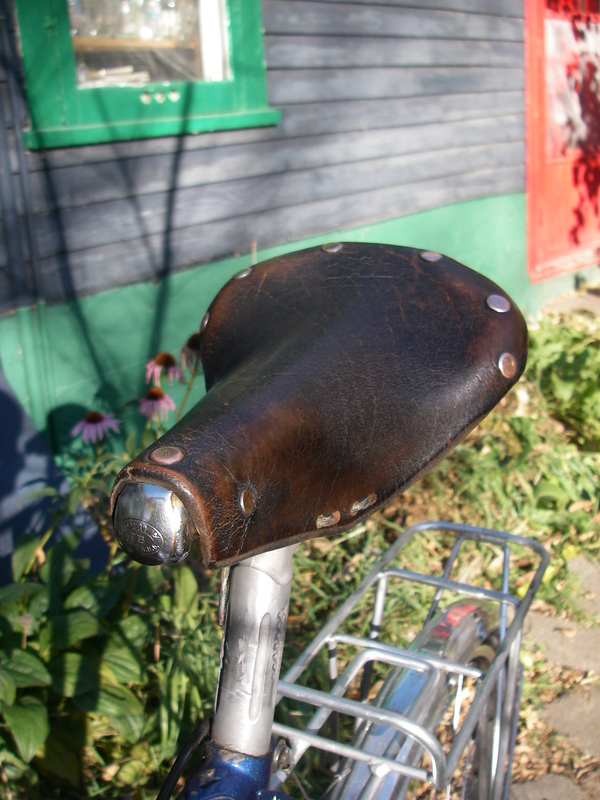 This was the first real test of the vintage Ideale saddle I had recently put on the bike. It made for a very comfortable ride. 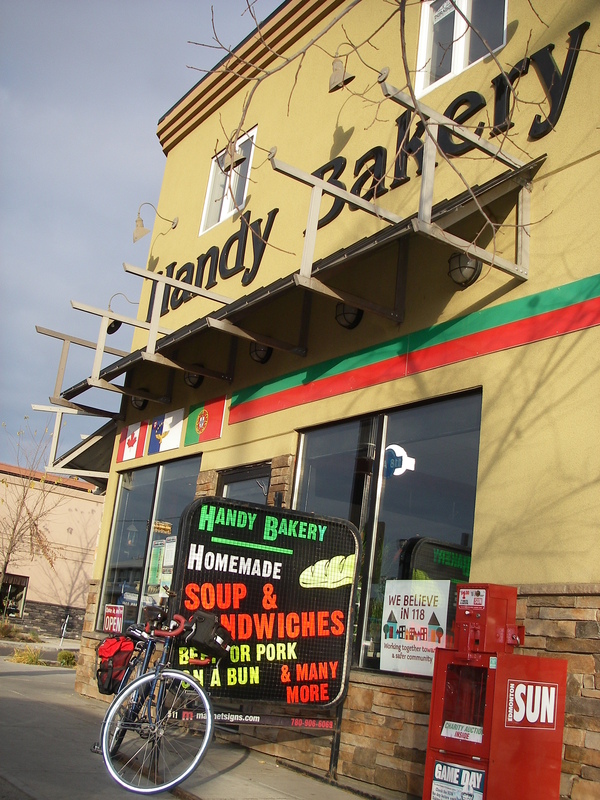 Picking up food at the Portuguese bakery. Heading North through the river valley. I was soon on the outskirts of the city. This was the best part of my ride. It was very peaceful moving briskly along the empty road. It was strange knowing that there were no vehicles approaching from behind and I wondered why it had taken me so long to get around to riding outside the city. These quiet roads were such a short distance from my house. Nishiki-san was running smooth and silent. I varied my route at my whim, sometimes North, sometimes West. 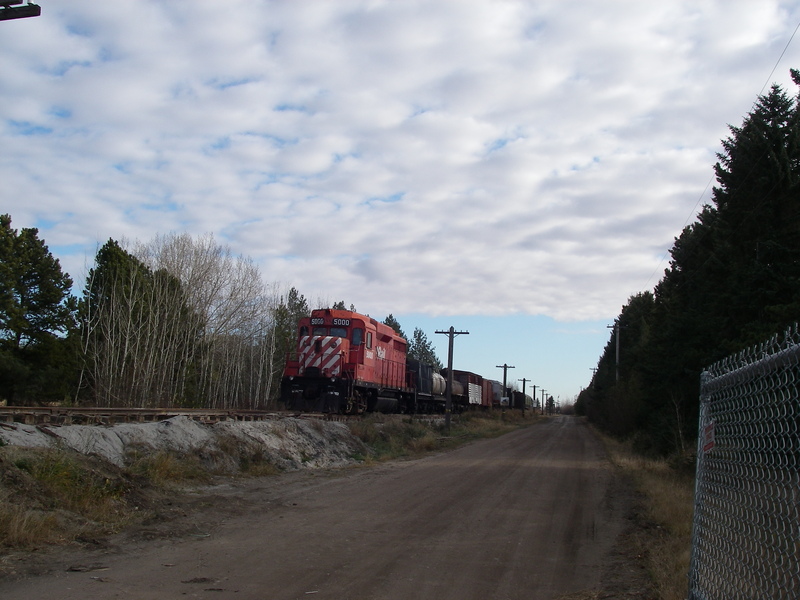 I headed an extra 5 km along one road to check out the Railway Museum although I assumed it would be closed. I was correct. 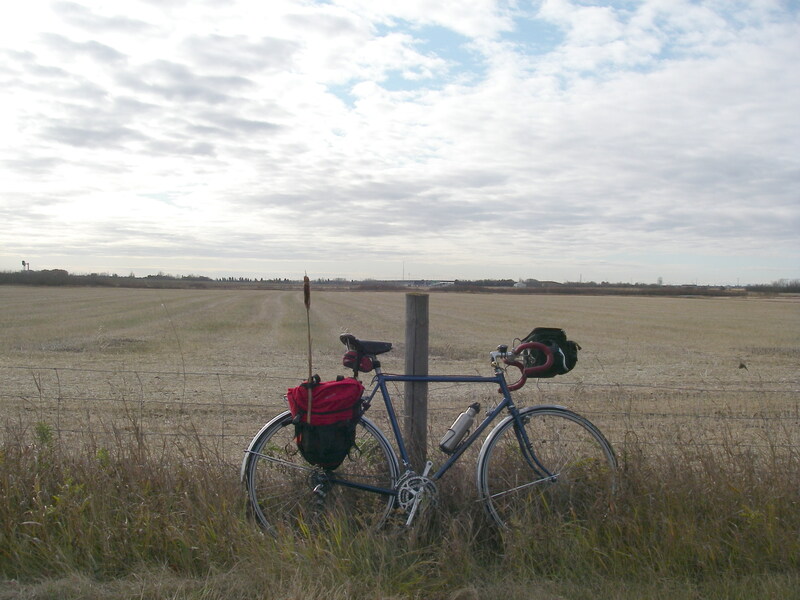 I pedaled past farmer’s fields and small groups of houses. I discovered an abandoned mountain bike ( a nothing special Supercycle). There was a field of at least 100 geese lounging about before continuing their flight South. Smart geese. Fleeing the Alberta winter sounds like a good idea. I stopped a one point to cut a cat-tail that I stuck in my pannier as a standard. Considering the length of time I’ve lived in Edmonton I have escaped the city very few times. Mostly I just enjoyed the feeling of riding in a rural setting. 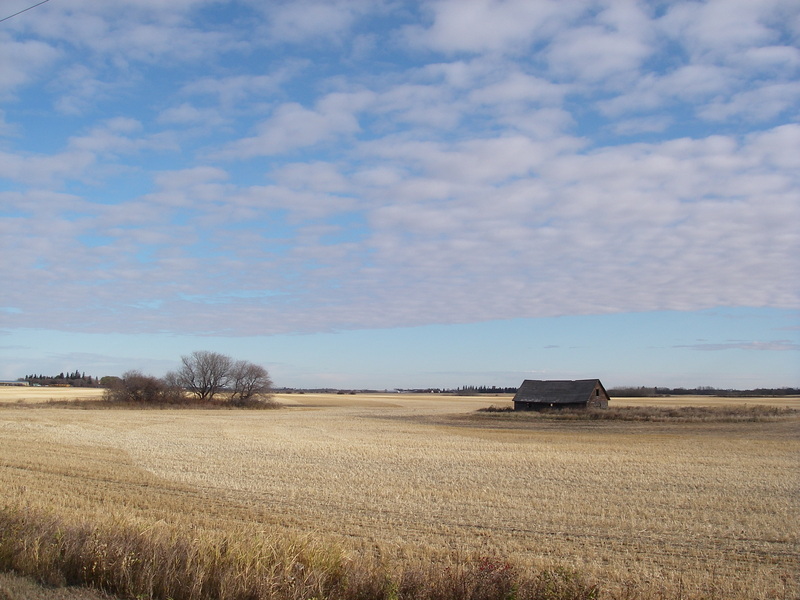 Though the details of the prairie rural landscape are different from the East Coast were I grew up there is a similar overall spirit. 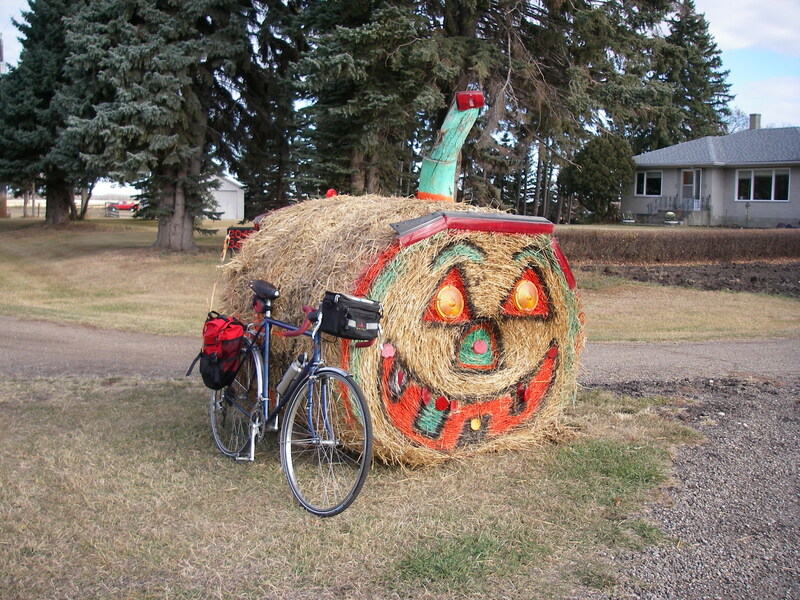 This Hay Bale Jack-o-Lantern alone was worth getting out of the city to see. Oh boy, I do so love this bike. It's just as well the Railway Museum was closed as I likely would have lost a lot riding time here. 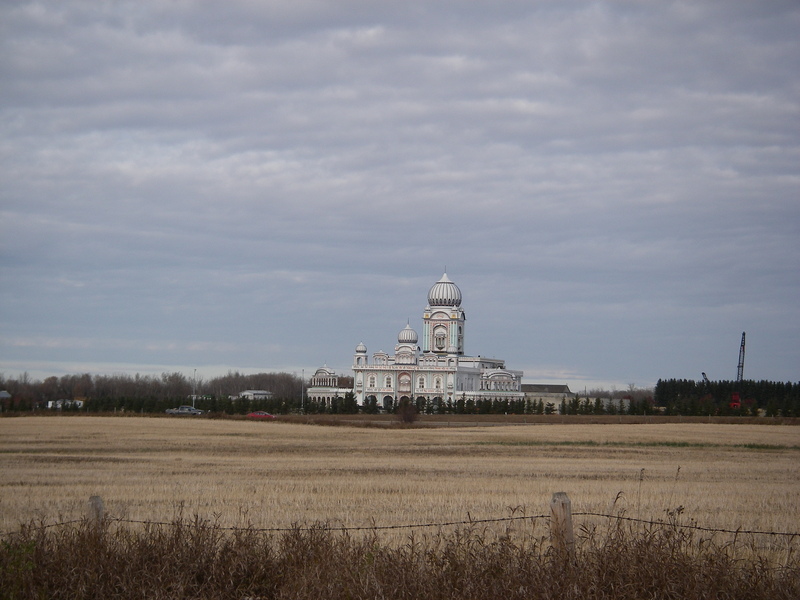 The big Sikh temple North of Edmonton. I never did use the map. Once you get out of the city there is very little to block the wind. The weather report from the city center airport tells me that the wind was still from the Northwest at about 25 km/hour. I can tell you that it definitely felt to be more from the West than the North. As I struggled West on highway 37 my speed rapidly dropped. At one point, as I toiled up a very slight hill into the wind my speed was an unimpressive 16km/hour. By this time I had started to get a feel for how long my trip was going to take. I knew that I couldn’t continue Westward and hope to get home in any reasonable amount of time and I was even tempted to give up. Instead, I decided to put my tail between my legs and flee back South into the city to continue my ride. It turned out that this was easier decided than done and it took some time until I reached the next good road South. 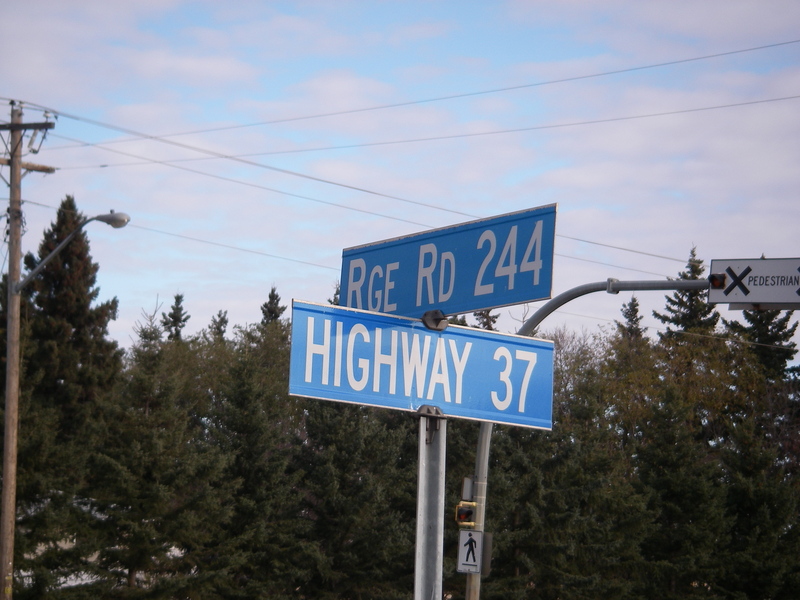 This was Range Road 244 at Namao. Idyllic postcard scenes like this made the ride into the headwind worth it. 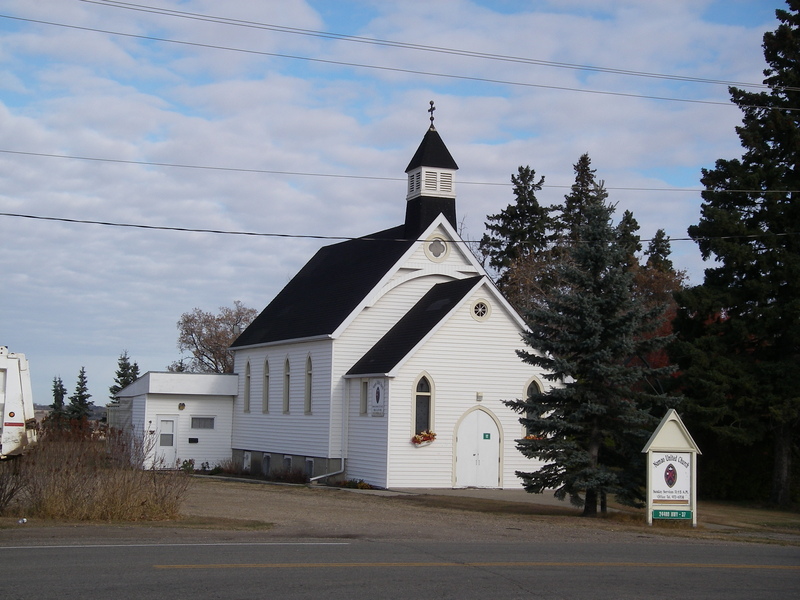 I like this tiny but well maintained church. 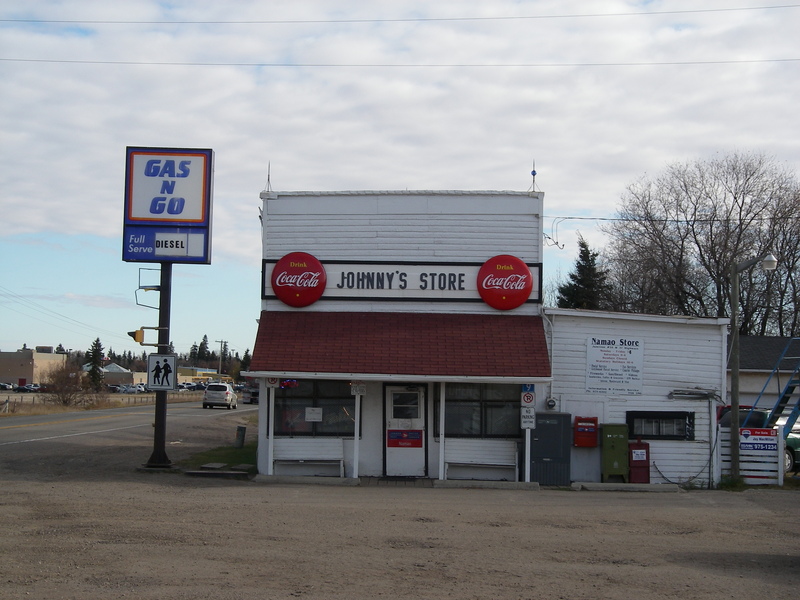 Across from the church was this very typical little prairie store. This is the point at which I fled back to the city. I rode briskly back towards the city, not entirely sure what my chosen route would be like. 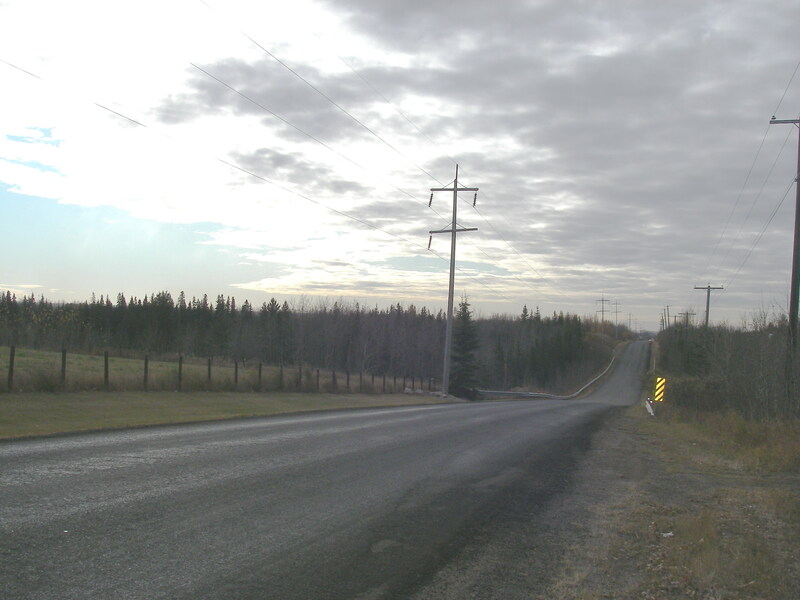 It started with more pleasant country scenery and light traffic until I neared CFB Edmonton. At this point I encountered another cyclist headed in the opposite direction! This would be the only other cyclist I encountered. As I passed by the Edmonton Garrison I learned that it is important to remember to zip one’s handle bar bag closed after use. Otherwise, when you hit a bump your lunch and camera may be violently ejected onto the asphalt . It turns out that my camera is more shockproof than I thought, thank goodness! 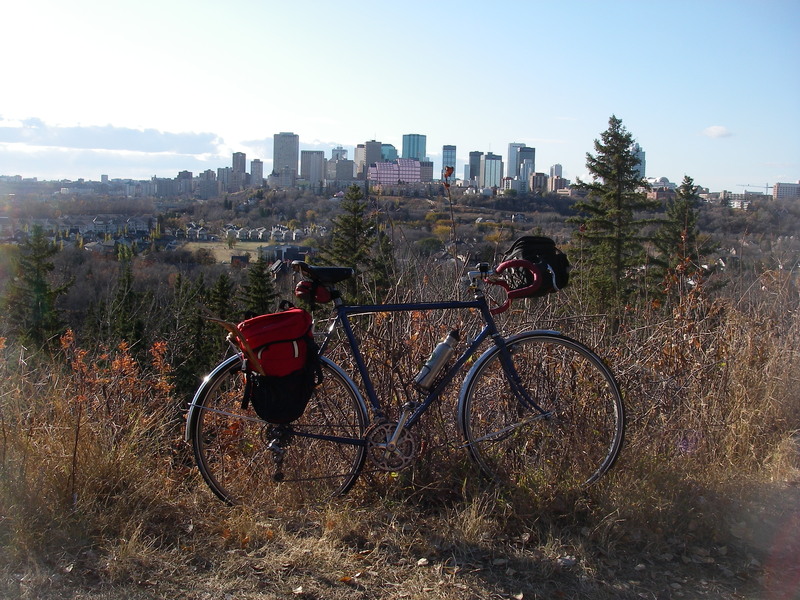 As I drew closer to the city I had to alter my route to avoid busy thoroughfares and dense traffic.After the idyllic country riding it was somewhat deflating to return to the urban blight of the far North end of Edmonton. Tightly packed, grandiosely named developments of bland monster homes clustered around stagnant looking ponds. I stopped for a brief rest in the pleasantly landscaped park surrounding Lake Beaumaris, a human-made lake that I used to visit when I first arrived in Edmonton and was living at my brother’s. I rode two quick laps around the lake and headed back up onto the city streets. Castle Downs is a good example of the sort of city planning that I dislike. 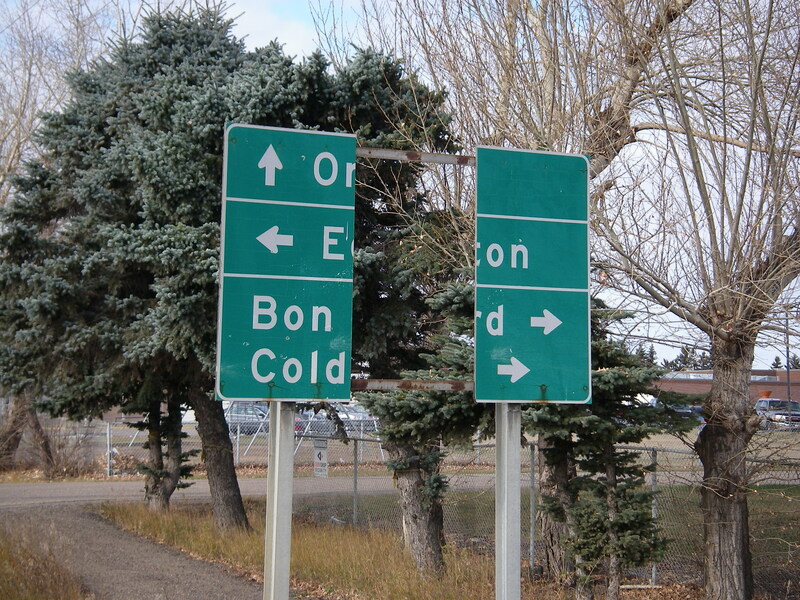 Unless you want to ride on the few main streets you get trapped in confusing, intestinal, looping roads and cul-de-sacs. I rode in circles for some time and was absolutely denied the chance to make any real progress West or South. I returned to the main roads. When I eventually worked my way back into the core of Edmonton my spirits started to lift. I rode the grid down the tree-lined avenues of the older neighbourhoods. 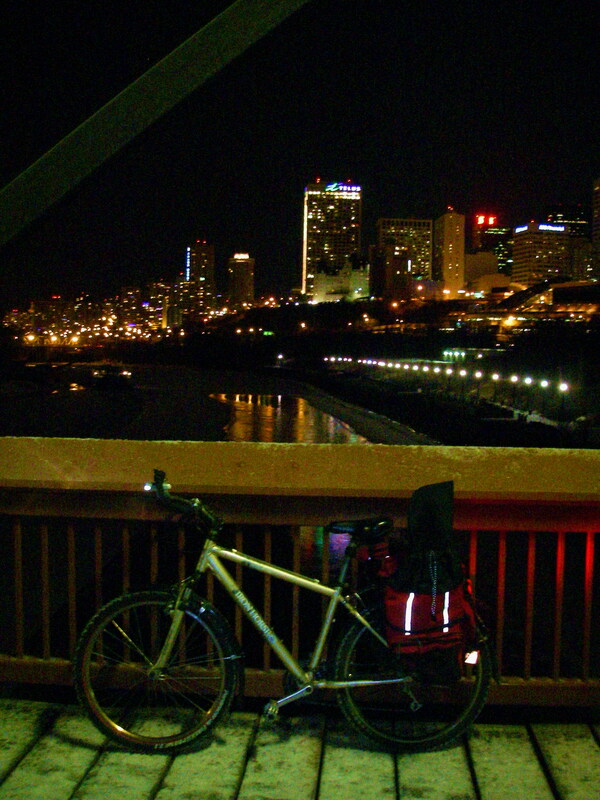 This is the Edmonton that I love and have roamed for the past decade. Although I was starting to feel a little tired, the ride started to be fun again. I dipped down onto the familiar river valley trails looking for the perfect spot to finally eat my lunch. 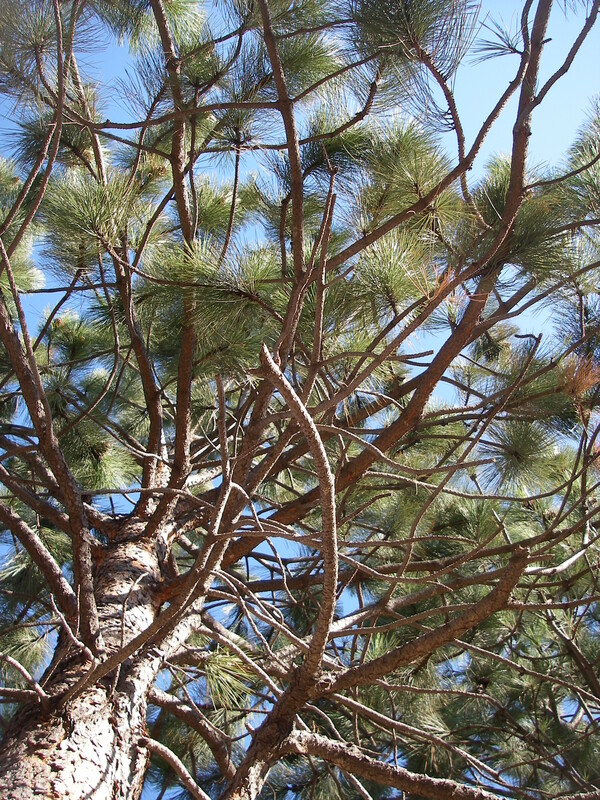 The perfect spot eluded me and I eventually stopped on the grounds of the Muttart’s to rest beneath a tree. Lunch was leisurely and pleasant. I discovered that the lady at the bakery had completely misrepresented the flavour of the cheese I had purchased. Instead of mild and creamy it was crumbly, pungent and incredibly salty. It was good, but a little odd. I ended the meal with few celebratory sips of scotch from my flask. After resting under the tree for a spell I climbed back on the bike and pushed on through the river valley, wanting to reach my goal quickly. As I toiled up the steep hill to Forest Heights I reflected that at this late part of the ride I should probably have remained up at the much flatter street level instead of descending into the valley. On the other hand,when I paced behind a slower cyclist near the top of the hill I could easily have overtaken him. That made me feel better. I gradually headed homeward watching the odometer for the big moment. As it turned out, I misjudged the distance home and I had to ride a few laps around my neighbourhood to reach the 100km mark. When the moment arrived I rang my little brass bell several times in self-congratulation. Minutes later I was resting comfortably in my kitchen rocking chair sipping a home-brewed apple cider. Ah, the cycling life is good. 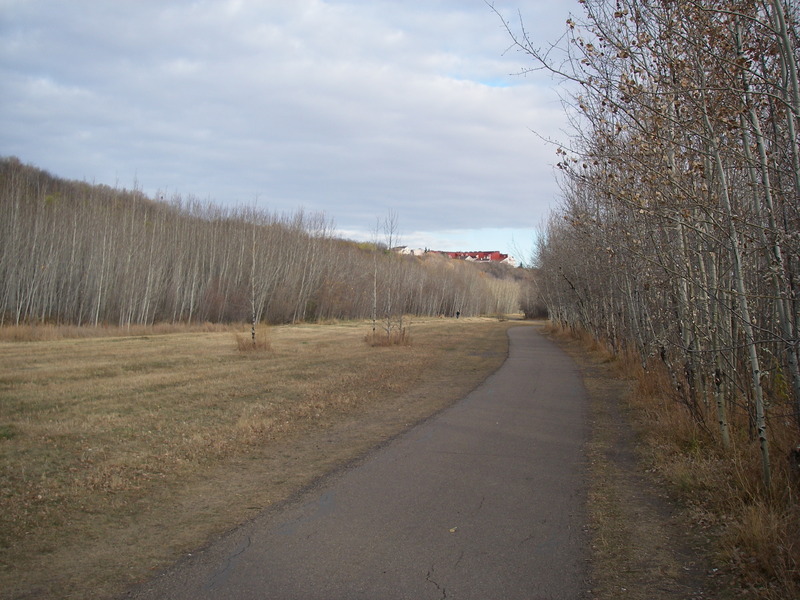 This path got me through some of the North Edmonton quagmire. 80 km into the ride. This is the view from flat on my back after lunch. My home for the past decade. Although I was somewhat fatigued I felt that I could have ridden farther still. With a little preparation I feel sure that I could complete a century ride. It was a bit late in the season to contemplate it, but it will definitely be a goal of mine for the summer of 2012. It is heartening for me to note that despite the headwinds, my numerous stops to take photos, and an extremely un-hurried lunch that I still completed the 100km in under the allowable time for a randonneuring populaire. I am quite happy with this result.Furthermore, on the following day I experienced no real soreness or other after effects. Not bad for a quadragenarian after his first long bike ride. 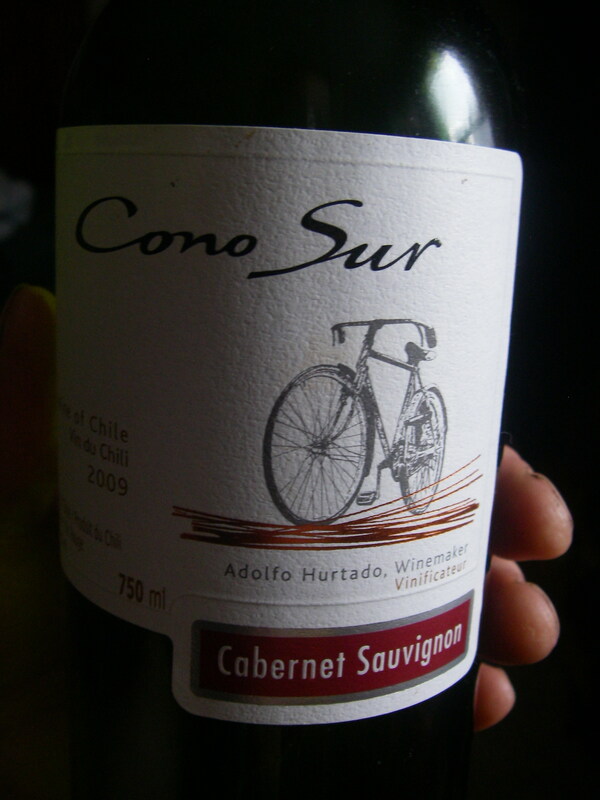 My wife mocked me for buying this bottle of wine. She found my criteria for selecting it to be questionable. On Sunday night I pedaled off to play music at a friend’s Solstice party. The temperature was a pleasant -5Celsius, so I didn’t have to worry too much about the cold affecting the instruments. 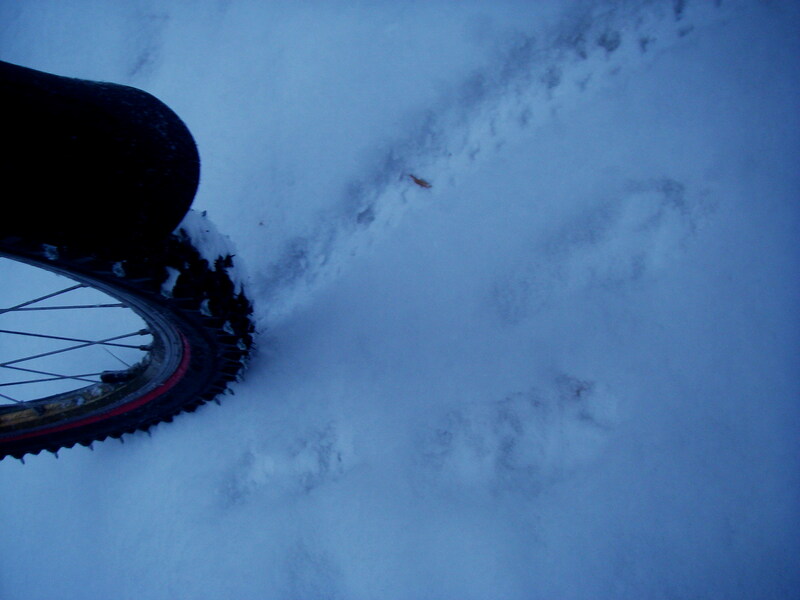 There had been a fresh fall of snow to cover the ice but I rode cautiously nonetheless as a fall would have been unwelcome. There were fiddles, recorders, guitars and some singing . I contributed mandolin, cittern and bodhran. One musician brought a bass recorder, which is a beast I hadn’t seen before. 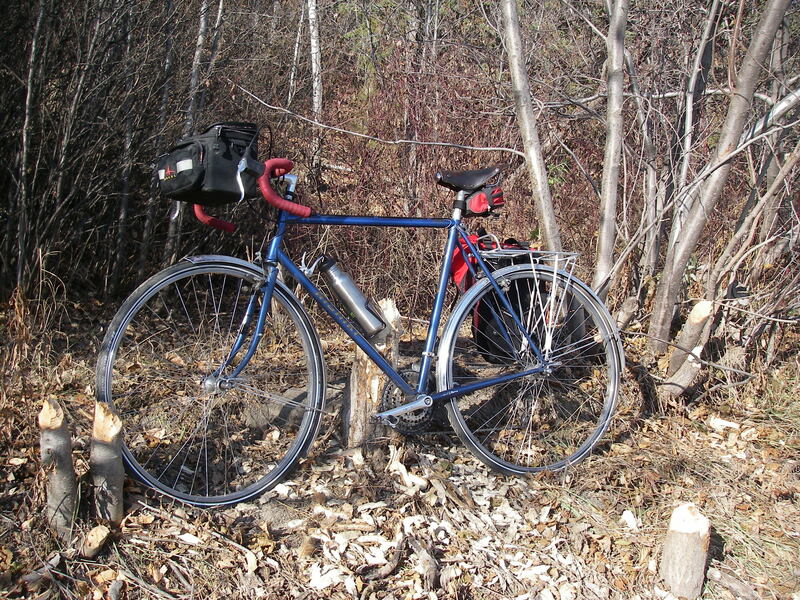 I had a very nice solitary ride home through the silent, empty ravine. I spotted a hare but didn’t succeed in getting a good photo. 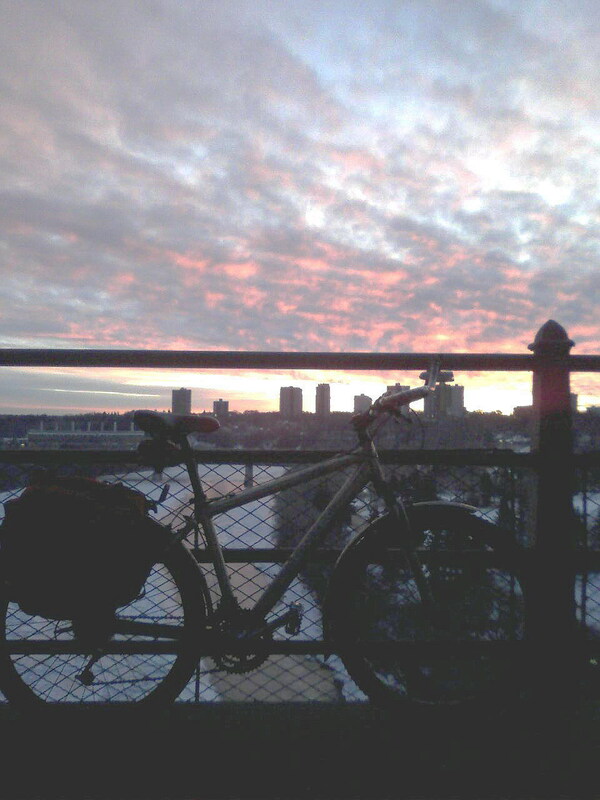 On my way across the High Level Bridge to the Farmer’s Market this Saturday morning I stopped to snap a pic of the lovely sunrise. I offer the usual apologies for the quality of my cell-phone camera. I really need a decent camera to carry with me. There was another man on the bridge photographing the sunrise with a tripod and a real camera. I was envious. 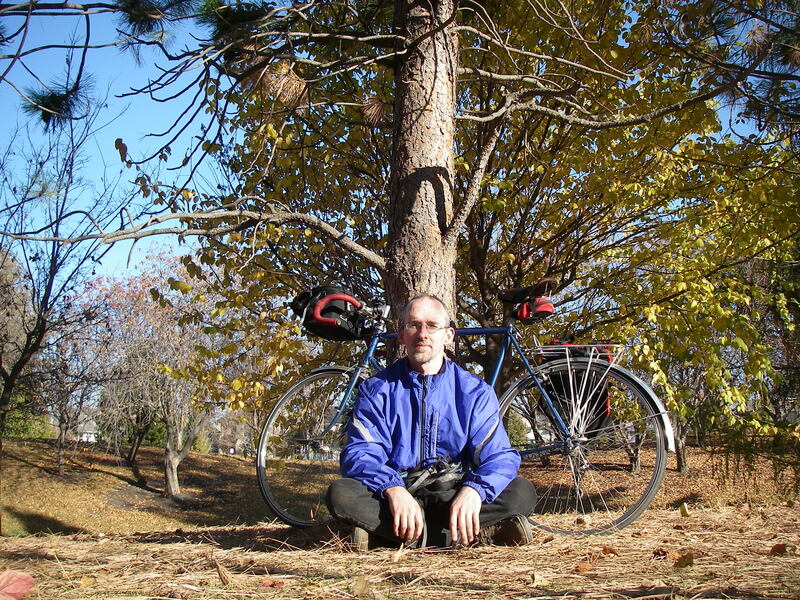 When I started this blog I had intended the two main topics to be bikes & busking. Hmmm….come to think of it that might have been a good blog title. Dang! Somehow, the bike part has totally taken over. This is not surprising, considering how much of my brain attic space has been filled with bikey things. Also, I have busked less this past year than others. I even missed a couple of football game busks which is something of a tragedy as they are usually lucrative. One of my busking implements. Pretty much all of my performing these days is in the LRT stations for big events. I like having large crowds funneled past me through the train station corridors. This makes for efficient busking. These locations are controlled by a permit system. I have a permit for the Commonwealth Stadium station and my busking partner has one for the Rexall Place station. Together we can cover a lot of games and concerts. Having a permit is very useful when winter arrives as none but the most desperate of performers would try playing outside on the frozen streets. Last Saturday night we played for the Edmonton Oiler’s vs Calgary Flames game. Non-local readers will find it helpful to know that there is a strong rivalry between these two Albertan cities and these games are always well attended. We buskers like that. My fingers produced the tunes with little difficulty. 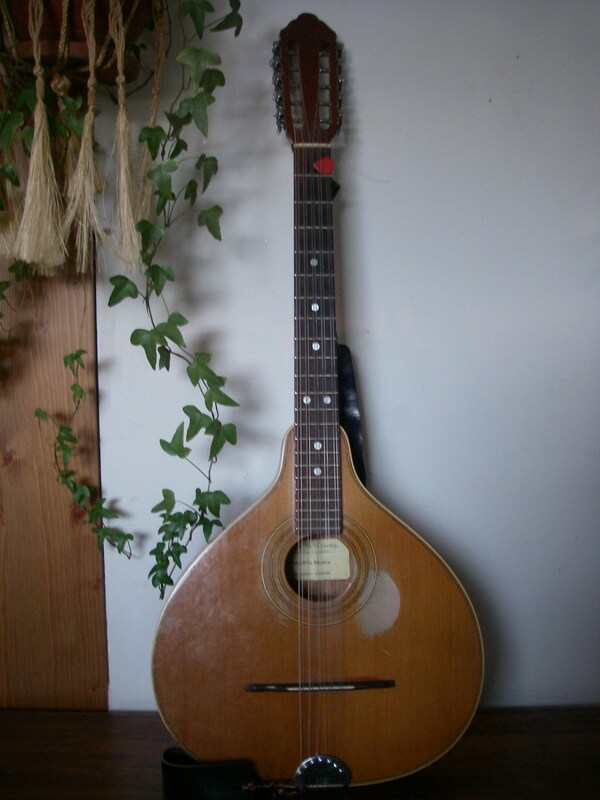 As usual I played some cittern and some mandolin. My comrade played guitar and pennywhistle. I tried out a new group of tunes without much faltering. All told, it was a lot of fun. The crowd was indeed large and quite generous on the way in to the game. I credit that to our awesomeness. Did you buy that? No? Well, we ARE awesome but it’s probably more the Christmas spirit at work. Also, the Oilers are finally having a season that isn’t terrible. It turns out that they lost the game and our revenues were predictably diminished for the outgoing crowd. One of the transit cops threw some money in the hat. I like it when that happens. Those folks end up hearing us play for several hours over the course of a event so I’m always happy when they like the music. As often happens, while chucking some coins into the hat one person complimented us and also complained about how bad the drummer is who busks outside using plastic buckets as his instrument. We hear that a lot. Still, he makes enough for it to be worth his while. There were a few non musical incidents of note. On the incoming crowd a teen walked past who had probably been in a fight. His hand was covered in blood and he had a cut over his eye. He went around the corner towards the area the transit cops were and some time later returned with a bandaged hand. This took a relatively short time so I guess he was OK and security didn’t feel the need to detain him. On the outgoing crowd we were just starting to play when a young woman came past yelling at a man. He left and she sat down on the floor and began sobbing. At this point, the game wasn’t over yet so the corridor was empty and echoing. I let the happy tune I was playing trail into silence. It didn’t seem appropriate. I fidgeted with my tuner for a few moments and debated going over to her and asking if she needed help. Would she want a scruffy busker weirdo bothering her? I had just decided to go over when she collected herself, took out her cell phone and walked off texting furiously. When busking one will often see these mysterious little glimpses of other people’s lives and almost certainly never learn the whole story. 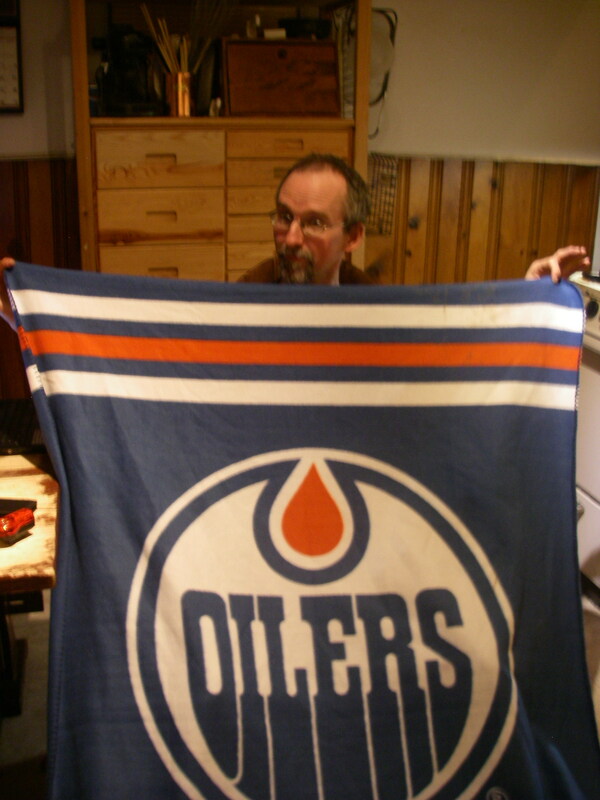 On a more positive note, one couple stopped and instead of giving us coins they gave us an Oilers’ blanket. In the din of the crowd I couldn’t quite hear what either of them said other than the guy telling me to take good care of the blanket. I agreed to do so. Over the years, we have received some odd textile items in lieu of cash. Most notably (on different occasions) a pair of pants, a hooded sweatshirt, and…a bra. Hares? Rabbits? I really don’t know which.